No matter what your age, body type, or fitness level, we're pretty sure one of your main workout goals is to improve your abs. And why not? 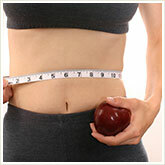 A flat midsection, with or without a visible six-pack, is the ultimate symbol of being fit and lean. (And yes, it looks great at the beach.) But it's not just a matter of vanity - a strong core helps stabilize your entire body. That's why every Beachbody workout program includes a variety of ab-tightening exercises. Take it slow. When you're doing crunches or other ab-focused exercises, it's easy to speed up and lose proper form, especially when you start to get tired. Either you let momentum carry you through much of the movement or you pull yourself up with your back and shoulders. But you'll get the most benefit (and the least chance of injury) from your workout if you concentrate on measured, controlled movements. And keep the abdominals contracted the entire time. After all, they're the ones that should be doing the work. (Doing some Pilates-style movements - like ChaLEAN Extreme's Pilates Roll-Up, in which you lift your upper body to a count of 8 is a good way to train yourself to slow it down.) When you can't do any more reps with the proper form, it's time to stop. Don't overdo it. If you really want great abs, you may be tempted to grind out crunch after crunch to the exclusion of other exercises, or to do more ab-centered workouts than your fitness program recommends. But directly working your abs too often can do more harm than good. Like any muscle, the abdominals need to recover between workouts. If you find you aren't improving the number of reps you can do or the amount of weight you can handle, that's a sign that you're overtraining, and you need to cut back. Don't neglect the rest of your body. The more you work your entire body, the better it is for your abs. In fact, just about any full-body or compound movement, from push-ups to squats to deadlifts, takes a lot of ab effort. (That's the whole point behind programs like Hip Hop Abs® and RevAbs, which give you great core results without focusing on crunches.) What's more, working your full body will burn many more calories and raise your metabolism, which is important, because you also need to . . . Lose the fat to make your abs flat. No matter how much you strengthen your abdominal muscles, the only way to get a flat midsection is to lose body fat. That's going to require a diet that's high in protein and fiber, low in simple carbs, and full of bulky, nutrient-dense foods that keep you full with fewer calories - and of course, plenty of water. If you're on a meal plan associated with a particular workout, make sure you're really following it and not fudging here and there. (Keeping a food diary can help.) When you combine an effective full-body workout with a proper diet, getting the flat abs you've always wanted is just a matter of time.